This particular inhalation and exhalation may be observed through the pulse by practitioners of archaic acupuncture. This pulse movement shows movement of qi between lung, heart, spleen, liver and kidney positions. Once inhale do not enters till kidney position, it produces disappearance of one pulse bit in one cycle of 50 bits. 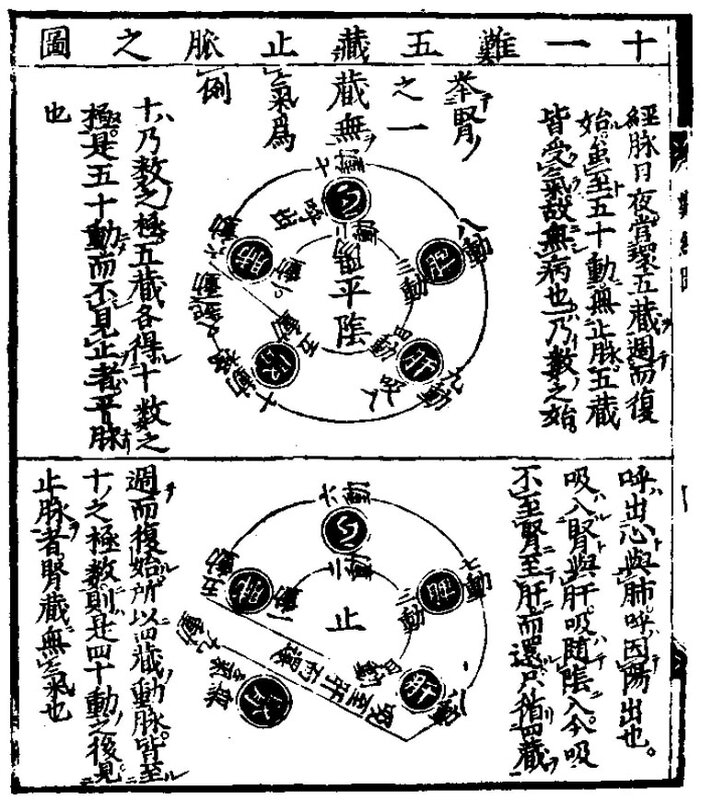 It means that breathing cycle can't be completed and qi cant move with inhale from the heart to the spleen, to the lung to the spleen, to the kidney and with exhale backwards from kidney to the spleen, to the liver, to the spleen, heart and lung as kidney has interruption, so sheng cycle becomes interrupted and qi start to move through the cycle of seven changes explained in difficulty 53. In this case qi produces five movements without entering kidney. Qi moves then from the heart to the lung, spleen, liver as inhale and backwards to the spleen and heart as exhale as shown in the picture on the bottom of the page.